It’s a Christmas miracle, I’ve made it 3 days in to a week long series without flaking out. We kicked off the week Monday with typography, Tuesday was making your own paper and who knows what is in store for the rest of the week. 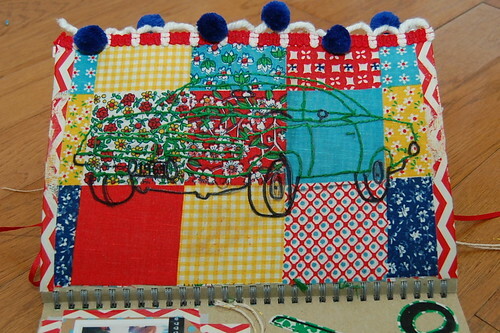 Today I wanted to show you the different ways I have been using fabric in my journal. 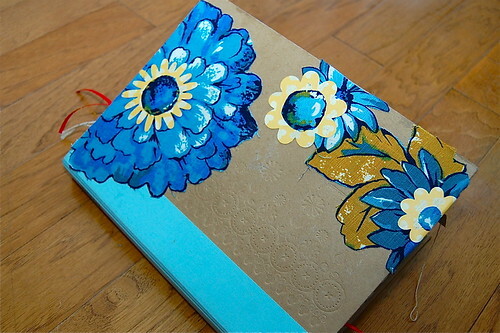 For starters I used a mix of vintage fabric, Dear Lizzy paper and a Big Shot to adorn the cover of my journal. I played paper dolls awhile back with some Harijuku kids. I adorned the cards with fabric and glittered accents. I think they fit in nicely with this layout. 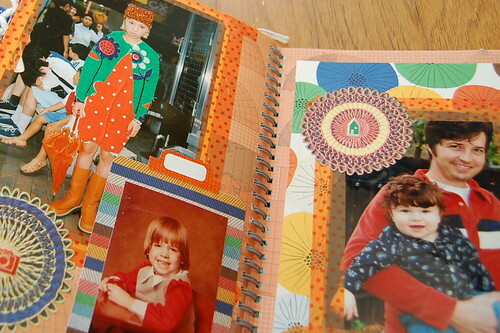 A little Amy Tangerine, vintage book images and Smashbook accessories thrown in for good measure. I love embroidering paper. That pop the needle makes when it punctures the paper and fabric is really satisfying. I first used fusible web to get this fabric on the page, used masking tape on the edges and then glued the ball fringe on the side. After all that I came back and ironed my transfer on and started stitching. The backside looks cool too. Hard to tell, but it is a muscle car. I hoard vintage fabric like I do vintage paper (and everything else kinda crafty). Finally, I have a use for all those quilt piece scraps. I’m not sure if I will add anything on top of this. I loved this quilting square so much I kinda want to let it shine. This little fella came in my Smashbook. 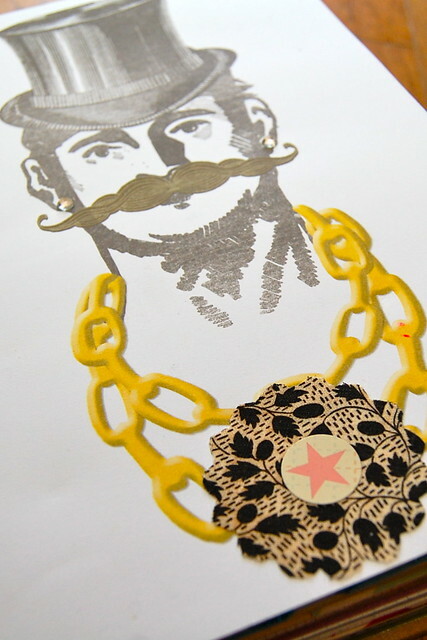 I decided not to cover him, but rather augment him with some stud earrings and a festive necklace made of fabric I cut with a Fiskars paper punch. I need to make more of these fabric frames for my photos. The small print on vintage feedsack is perfect. A little Amy Tangerine and Maybe Me J mixed in. 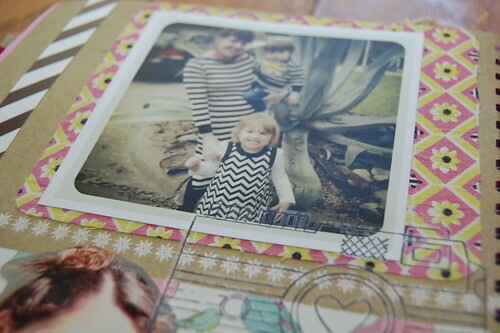 This fun little hybrid page uses elements from Kitschy Digitals and Cosmo Cricket. I added some vintage fabric and rick-rack to frame it out. I love the Holly Hobby Look. 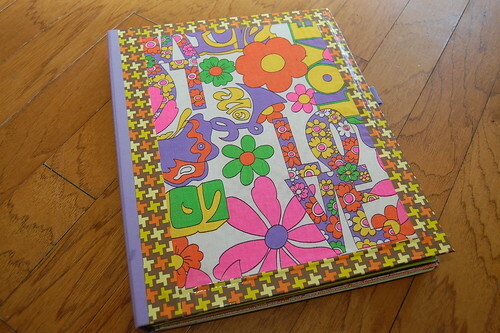 Last but not least I leave you with the cover of the other Smashbook I am currently working on. I used fusible web on a groovy 60’s napkin and trimmed it with duct tape from Todd Oldham’s Kid Made Modern Line. Now I just need to do the backside of both. 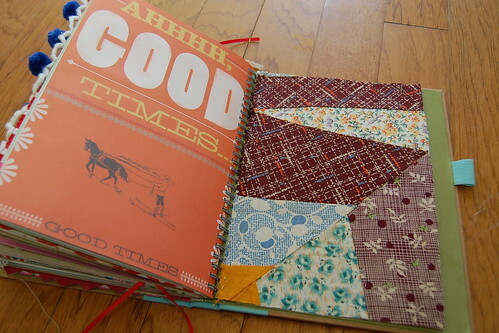 How do you use fabric or textiles in your journaling? What is your favorite method of adhering fabric to paper? Also, do you have any tips or tricks for cutting fabric shapes with paper punches? My Big Shot works like a charm, but my paper punches are proving to be a bit tricky. 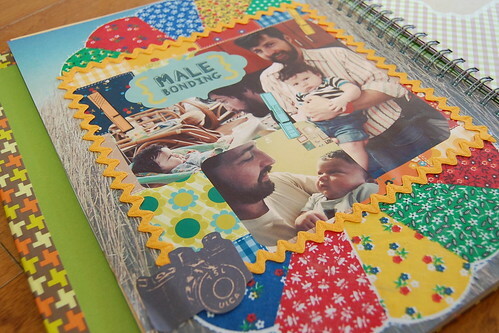 Posted March 21, 2013 & filed under Crafts, digital scrapbooking, Paper Crafts, Paper Crafts.